People are rarely neutral about the Irish language. In Northern Ireland it is a topic which usually creates more heat than light. While attitudes have softened somewhat over the years, polarised views about the language are remarkably persistent. Historic and contemporary efforts to maintain the language have had varied success, but the key goal of creating new sustainable language communities, where inter-generational language transmission is the norm, has yet to be achieved. Building such communities requires the support and engagement of central and local government, broadcasters, educators and a wide range of other interest groups. It requires a shift in attitudes, appropriate language policies, an in-depth examination of our past and a willingness to learn from it. Trust, a cross-community Irish language organisation based in Belfast, was uniquely well-positioned to answer these and many more related questions. He provides a comprehensive, insightful and thought provoking survey of the challenging complexities of culture and language in Northern Ireland. These essays, written between 1990 and 2011, are well-argued, witty and refreshingly honest. This sometimes controversial but always compelling collection will illuminate and stimulate debate. 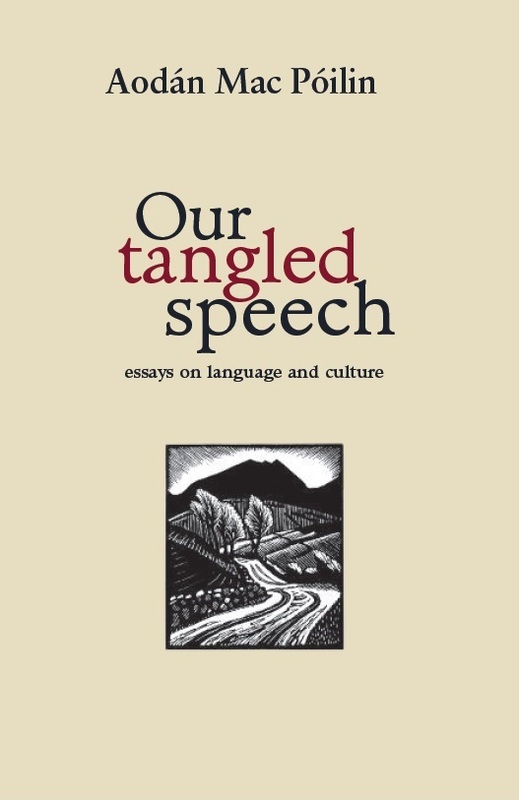 It will appeal to the language activist, academic and general reader alike. AODÁN MAC PÓILIN (1948–2016) spent his life working with and for the Irish language. He was by his own admission a ‘late bloomer’, having learned Irish as an adult. He moved, with his wife Áine Andrews, to the Shaws Road Gaeltacht in west Belfast in the mid-70s and was proud that Irish was their daughter Aoife’s first language and that she is passing it on to his grandchildren. He was actively involved with the Irish-speaking community there and was Chair of the first Irishmedium school in Northern Ireland at a critical period in its development. He was also a founding member of Comhairle na Gaelscolaíochta. broadcasting. He represented the Trust on a wide range of organisations, including the European Bureau for Lesser-Used Languages, Colmcille, The BBC Northern Ireland Broadcasting Council, Foras na Gaeilge, The Seamus Heaney Centre and was Chair of Ciste Craoltóireachta na Gaeilge. Aodán wrote and lectured extensively on many aspects of the Irish language, literature and culture. He edited Styles of Belonging: the Cultural Identities of Ulster (1992), Ruined Pages, New Selected Poems of Padraic Fiacc (1994) and The Irish Language in Northern Ireland (1997). He was a member of the editorial panel of The Great Book of Gaelic (2002) and co-edited Bás in Éirinn (2012). He was also a highly accomplished translator of Irish language prose and poetry. AODÁN MAC PÓILIN (1948–2016) spent his life working with and for the Irish language. He was by his own admission a ‘late bloomer’, having learned Irish as an adult. He moved, with his wife Áine Andrews, to the Shaws Road Gaeltacht in west Belfast in the mid-70s and was proud that Irish was their daughter Aoife’s first language and that she is passing it on to his grandchildren. He was actively involved with the Irish-speaking community there and was Chair of the first Irishmedium school in Northern Ireland at a critical period in its development. He was also a founding member of Comhairle na Gaelscolaíochta. Aodán, as Director of the ULTACH Trust (1990–2014), laid much of the groundwork for cross-community engagement with the Irish language in the early 1990s. He was a passionate and articulate advocate for the language, making significant and strategic contributions in a variety of areas, including Irish-medium education, language planning, the arts and Irish-medium broadcasting. He represented the Trust on a wide range of organisations, including the European Bureau for Lesser-Used Languages, Colmcille, The BBC Northern Ireland Broadcasting Council, Foras na Gaeilge, The Seamus Heaney Centre and was Chair of Ciste Craoltóireachta na Gaeilge. Aodán wrote and lectured extensively on many aspects of the Irish language, literature and culture. He edited Styles of Belonging: the Cultural Identities of Ulster (1992), Ruined Pages, New Selected Poems of Padraic Fiacc (1994) and The Irish Language in Northern Ireland (1997). He was a member of the editorial panel of The Great Book of Gaelic (2002) and co-edited Bás in Éirinn (2012). He was also a highly accomplished translator of Irish language prose and poetry.